This weekend saw the Baldwin family take a trip to the Windsor based plastic block metropolis otherwise known as Legoland. I have to say that once again, we all had a good time and this year we all got our first experience of the Star Wars Miniland Experience and the Atlantis ride (both of which were terrific). In my opinion, Lego is a fantastic brand, the range of building blocks is vast; the blocks are robust (you have to work hard to break one); they can be reused and recycled into a never ending array of creations; every single block presents the brand multiple times over across its dimples; they appeal to my nine year old son and five year old daughter at the same time (and that’s amazing); the pieces function properly in that they connect and they hold so that the things you make won’t just fall to pieces…………… I could go on, and then on some more! Lego would undoubtedly appear in my top ten list of brands and that is praise enough! Wandering around Legoland is thought provoking because the consideration and effort that goes into making the Lego exhibits is staggering. The famous buildings or landmarks are awe inspiring; when you reflect upon how many blocks were used and how long each thing took to make, you can’t help but feel the model makers deserve some applause, in fact make that a standing ovation! The patience needed to build these things, let alone the engineering considerations to make them stand up and survive the UK climate, not to mention the attentions of over enthusiastic, light fingered children, is mind boggling. No doubt James May was similarly inspired when he used Lego to make a house, which he then lived in for a night! The kids rushed around the models going wow occasionally and thinking about what ride to queue up for next; I wandered around thinking wow more regularly and dreading the next round of queue boredom (especially when I had to queue just for the privilege of watching a Baldwin dependant ride). Some queues though were better than others; on a few occasions the prize more than made up for the pain. 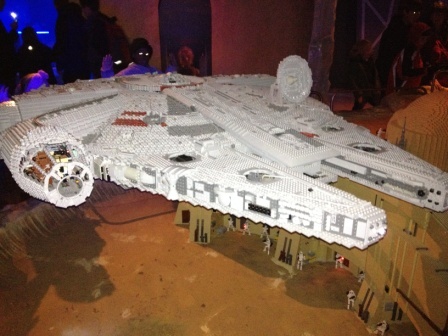 The Star Wars gallery was great, in one Lego film scene re-creation, a huge Millennium Falcon fires up and takes off from Mos Eisley, Tatooine. I loved that exhibit as much as any youngster present! So much so, I have even included photos! The full size Lego block models of Chewbacca, C3PO and Darth Vader were great for impromptu photo shoots with the young Baldwins. The Atlantis ride features a submarine type structure that sails around an aquarium where the riders sit below the water line and can see sharks, rays and other fish swimming in front of their noses. It is well worth queuing up for this one and the Baldwin family (in a unanimous vote) rated this as the best ride of the day! 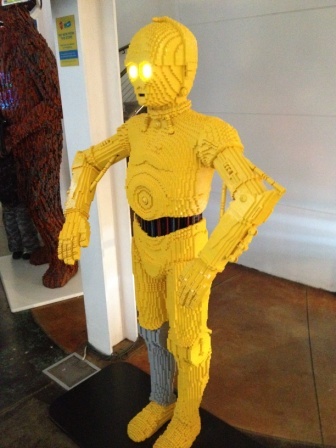 Legoland is expensive, it’s always busy, the queuing is depressing and your children will fleece you in the on-site shops but; it’s good, the kids will have a great time, they will go home worn out and there is enough there to interest the adults too (particularly dads that like engineering and sci-fi). Legoland gets the thumbs up and we will make the pilgrimage to Windsor again next year!